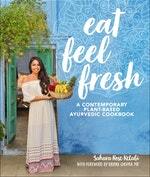 Balance your Dosha with this delicious, Ayurvedic smoothie recipe from Eat Feel Fresh. Surya smoothies are my version of digestive-enhancing Ayurvedic smoothies that are warming for the digestion. Even in the summer season, Ayurveda still recommends avoiding cold and frozen foods because it impedes digestion. The smoothie I opt for is my Pitta-balancing Summer Sun Smoothie from Eat Feel Fresh, which contains strawberries, coriander and cooling jasmine tea. Pittas are the type of people to say, ‘I can’t just have a smoothie for breakfast, I’ll be hungry five minutes later.’ What they’re missing are the healthy fats to keep them satiated. Add some coconut butter and/or avocado to this smoothie and watch your Pitta hangry-levels disappear. Not only will you be left happy, but so will your colleagues who have to deal with you. Pour into a bowl and top with chia seeds, strawberries, and coriander.